Kiehl's In Singapore: Kiehl's Boy sharing the 5 steps to BREAKTHROUGH CLARITY!!! Kiehl's Boy sharing the 5 steps to BREAKTHROUGH CLARITY!!! Always wanted to have a more CLARIFYING & FLAWLESS skin? Kiehl's Dermatologist Solutions Clearly Corrective White is here!!! It is the newest, fastest, exceptionally effective 5-step regimen developed for Asian customer like us to acheive FLAWLESS & LUMINOUS skin!!! with Kiehl's Clearly Corrective White- Purifying Foaming Cleanser. This foam cleanser removes skin surface impurities without stripping off for a noticeably brighter complexion. After using my skin feels clean and it don't give you a tight uncomfortable feeling. with Kiehl's Clearly Corrective White- Skin Brightening Exfoliator. Well a lot of people or guys I would said will skip this type. It is every important to use an exfoliator because it helps to remove dead skin cells and help to minimize surface irregularities and dullness. This exfoliator is gentle and suitable to use daily to help diminish persistent dark spots and discoloration, and promote a smooth and even complexion. TONE your skin with Kiehl's Clearly Corrective White- Clarity Activating Toner. Yes if you are a guy and you don't know what is a toner for then I'm going to tell you now. A toner is use with a cotton pad after a cleanser normally. This toner retexturizes as it infuses skin with hydrating actives for noticebly cleaner and softer skin. TREAT with Kiehl's Clearly Corrective White- Clearly Corrective Dark Spot Solution.Thishighly efficacious dark spot corrector is formulated to have a visible impact on a board spectrum of dark spots including those caused by age, hyperpigmentation. You can say goodbye to DARK SPOTS!! !With daily, continuous use, skin is visibly brighter, more even and radiat with a visible improvement in clarity. Moisturise your face with Kiehl's Clearly Corrective White- Hydrating Moisture Emulsion.This moisture treatment intensively corrects visble uneven skin tone and includes an ingredient active that helps deter the formulation of new pigmentation irregularities on skin surface.Skin gets everlasting moisture!This quickly penetrating fluid works as part of the Clearly Corrective regimen to help visibly diminish persistent dark spots and discoloration, while hydrating your skin. This is simply so cool!!! Lastly you need to PROTECT your skin with Kiehl's Ultra Light Daily UV Defense with SPF 50PA+++ UVA. Slows down facial skin aging process. Maybe some of you do not know what is the SPF and the +++?SPF refers to the sun protection factor, PA refers to the amount of protection the sunscreen offers against UVA rays. More plus symbols mean more protection from UVA and UVB rays.UVA RaysThis kind of radiation is actually the major contributor in having skin cancer if you get to have more constant exposure to it throughout the year It has the ability to go deeper into your skin than UVB radiation.UVB RaysIts main target would be your epidermis, or the outer layer of your skin. It is also the primary reason why you get sunburn. UVB rays are also considered to be the major cause of squamous and basal cell carcinoma, and a significant contributor of melanoma. Below it's an illustrated story that might happen to anyone else if we do not take care of our skin well.Karen, 25, who loves outdoor sport like beach volley and hiking found out recently that she had brown spots appearing on her face. This was because she did not take care of her skin properly. She thought brown spot only happpened to old people. But she is wrong, because brown spots, uneven skin tone may appear if you are expose to the sun very often.After she realised she had brown spots on her face, her life changed.She got so worried to get close to her friends and male friends especially. Resulting in lack of confidence and low self esteem. And that was why she was still single for very long. She need a solution!!! Yes Kiehl's Clearly Corrective White 5 steps regimem is the right product for her to treat her brown spots problem and also to protect her skin from further damaging. After reagining back her beauty, she started to mix around and go out with her friends more often then before. She found a BOYFRIEND!!! She is no longer afraid of facing guys!!! When you have a flawless and luminous skin, you don't mind just getting more CLOSER! 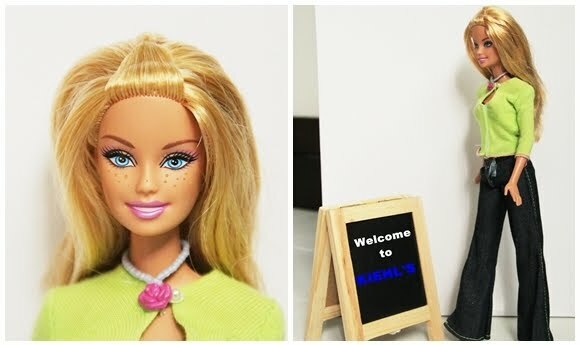 Having a better skin complexion had certainly changed Karen's life!! !She had regained back her confidence! If you are looking for a solution that can help you breakthrough CLARITY!!! A brighter and more evenly toned skin!! !Then you gonna try this Kiehl's Clearly Corrective White!!! Yes! How to try? When I say try I mean you will get a COMPLIEMENTARY SAMPLE of this cool product!!! How's that? So cool right? JUST FOLLOW THESE SIMPLE STEPS TO GET YOUR COMPLIEMENTARY SAMPLE!!! 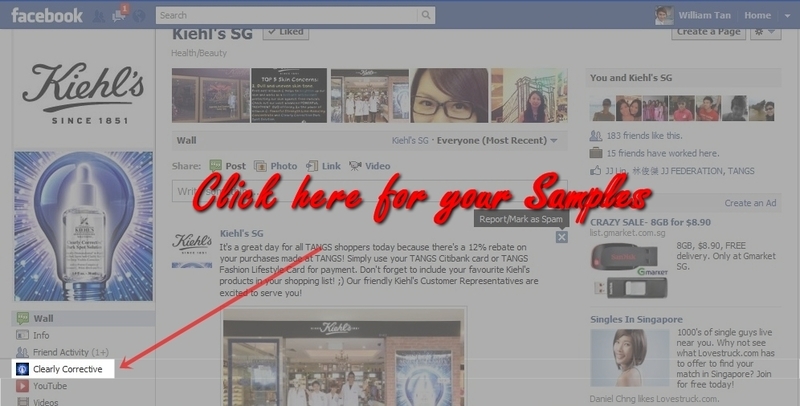 So now head to Kiehl’s Facebook Fanpage and click on the 'LIKE' button. After you’ve LIKE the page, click on the tab on the left that says “Clearly Corrective” as shown in the image below. Then you come to this page, click on "GET A SAMPLE NOW". You can do the review later at this page too. The last step, fill in your name,mobile number and email. On the how did you know about this facebook tab, click on the drop down button and select “http://onlywilliam.blogspot.com” as shown below. THANKS!!! And when you are DONE, you will get a SMS from kiehl’s to receive your complimentary samples. 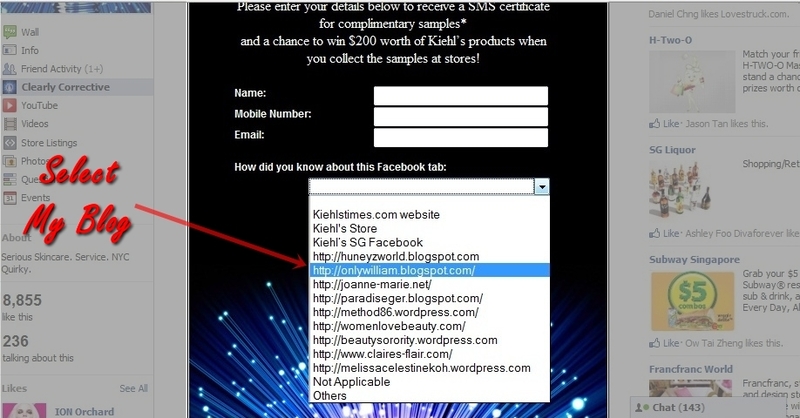 You stand to a chance to win $200 worth of Kiehl’s products when you collect your samples from the store! You can even review the product after you try out. Simply click on the REVIEW NOW button to review the product! Every week, 1 best review will walk away with the Clearly Corrective Dark Spot Solution (30ml) worth $90. GOOD LUCK!!! 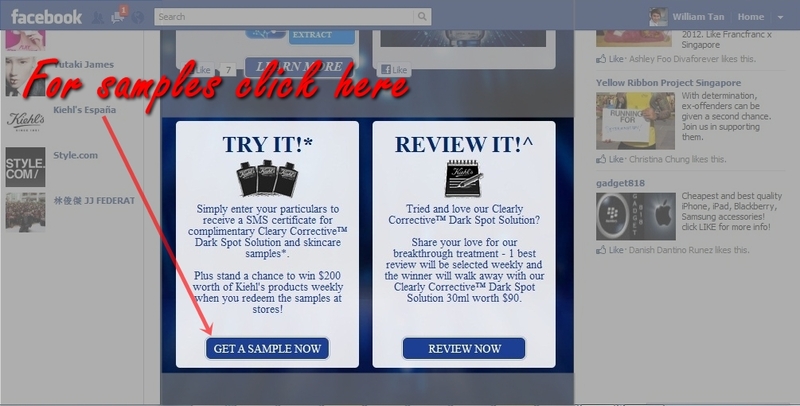 Visit Kiehl’s Facebook Fanpage today!! !